BERLIN (AP) — Chancellor Angela Merkel's successor at the helm of Germany's main center-right party sought to consolidate her power on Saturday after a narrow victory, installing a young conservative in a key leadership post in an effort to build bridges with her rivals. Annegret Kramp-Karrenbauer, a Merkel ally close to her centrist stance, was elected as chairwoman of the Christian Democratic Union on Friday. She narrowly defeated Friedrich Merz, a one-time Merkel rival representing a more traditionally conservative approach and a clearer break from the longtime chancellor's era. Another sometime Merkel critic, Health Minister Jens Spahn, was eliminated in earlier voting. Kramp-Karrenbauer, 56, showed Saturday that she is keen to prevent lasting divisions and give conservatives and younger members a strong voice. She nominated Paul Ziemiak, the 33-year-old leader of the party's youth wing, to serve as her general secretary — the official in charge of day-to-day political strategy and the job she held herself until she was elected leader. "This party is not split — we all have the task of working on the unity of this party," she told a party congress in Hamburg. Ziemiak, who ran unopposed, won the support of 62.8 percent of delegates, a result suggesting Kramp-Karrenbauer still has plenty of work to do. Ziemiak is further to the right than Kramp-Karrenbauer, is considered a friend of Spahn and comes from the same region as Merz. Kramp-Karrenbauer, a Catholic who is herself a shade more conservative than Merkel on social and security issues, faces pressure to improve the CDU's electoral fortunes after a dismal year in which Merkel's uneasy governing coalition with the center-left Social Democrats lurched from one crisis to the next. Four state elections loom next year, including three in the ex-communist east, where the anti-migration Alternative for Germany is strongest. That party's co-leader, Alice Weidel, described Kramp-Karrenbauer as "Merkel 2.0" and said that "the last conservative Christian Democrats have lost their battle." Kramp-Karrenbauer will need to prove her wrong. She says she plans to review her party's migration and security policies early next year. And she faces a first nationwide vote in May's election for the European Parliament, often a painful experience for governing parties. 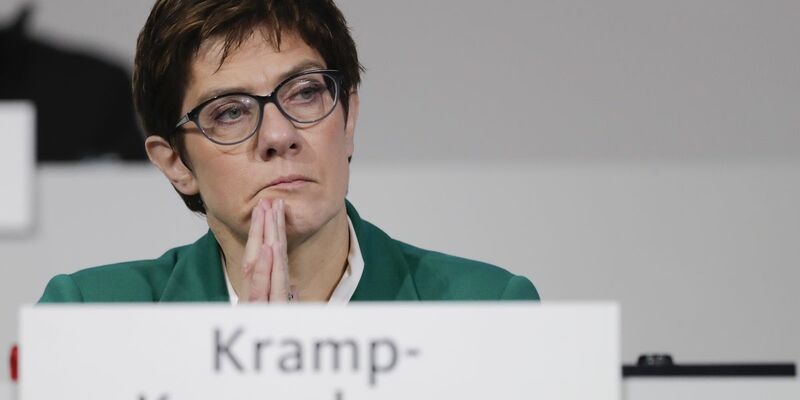 Kramp-Karrenbauer served for years as the governor of Saarland state, a western border region with strong ties to neighboring France, Germany's traditional partner in leading European integration. Setting out her pitch on Friday, she called for "a strong Europe that completes Schengen," Europe's border-free travel area, and advocated for a European army, something France's president has called for. "There must be no doubt that we are the party that really stands for Europe," she said on the campaign trail last month. Kramp-Karrenbauer is promising to give her party the first say in discussing policies, rather than digesting decisions already made by the government. It's unclear how much friction that could cause with Merkel. Merkel plans to continue as chancellor for the rest of this parliamentary term. The next election isn't due until 2021, but it's uncertain whether her governing coalition will last that long. Kramp-Karrenbauer is the favorite to run for chancellor in the next election, though that isn't automatic.